PST Etalon with a Quark, Log & Results - SolarChat! I'm looking for some info, a user (Jozef) hasn't been active in over 6 months on the forum so I'm not sure a message would reach them. However, they were using a Quark (with 4.2x telecentric internal and intact) with a 2" eyepiece adapter and inserted a PST etalon into the eyepiece of the Quark, and then a camera into the back of that, with adapters. I know others have done this too. Some with success. Some without. I have the parts just laying around, so I figure, why not try it out? Who knows, maybe I have some decent stuff to pair up, or maybe this is just an exercise in tinkering that will result in nothing but information and no images. That's ok too. I'm wondering if I have to remove any lenses or anything from the PST etalon. I have removed the brass tube and the black box and have the etalon housing itself intact. I have the adapters front & back from AOK swiss. Can this be inserted into a 2" eyepiece Quark like this and then a camera in the other end and function? This seems to be what Jozef was doing and it worked. But I'm not sure if anything was removed from the etalon housing of the PST. Naturally I would test this myself. But, as the old curse goes, the moment my adapter showed up in the mail today and I was able to disassemble the PST housing successfully, a big pile of stormy dookie has been sitting over me, all day. All day. "Sunny Florida." And of course.... the resulting immediate weather secondary to this. Last edited by MalVeauX on Fri Dec 14, 2018 4:17 pm, edited 3 times in total. You will have to remove both lenses of the PST etalon. So I need to remove both collimating lenses from both sides? Leave only the etalon? In the configuration you're proposing the bare etalon will be sitting in the collimated/ telecentric beam at around f30-f40. I've done the same Marty. So confirming, I remove both the front collimating lens and the back collimating lens from the etalon housing, leaving just the etalon in the mechanical pressure tuner housing with no lenses or anything on either side. Last edited by MalVeauX on Fri Dec 14, 2018 4:17 pm, edited 1 time in total. Last edited by MalVeauX on Fri Dec 14, 2018 4:18 pm, edited 2 times in total. Relax, please. After a deal, I will send you the sketch and photos of how to make this system work. Again, I already have this stuff just laying around, so this is an experiment to see what can result from it. Maybe nothing. Maybe something. I will likely use this with my 150mm F8 refractor and Quark until my next system is assembled and ready for use. I'd do it right now, but it's still raining and this storm will be here a few more days. Bunch of nasty weather coming from the West right now. Ugh. This is the imaging train I'm thinking of trying. I have all of it. Just waiting to see if I can get focus and how this etalon performs in the train when the storm passes... And if it doesn't work, not a big deal, I'll use the etalon for other projects or reinstall it back into my PST and go back to just using the PST as I was before. No biggie. But, if it works.... well, then who knows! The adapter by Beat Kholer over at AOK Swiss are excellent, they fit perfectly, and they're very friendly nice chaps over there. Inexpensive for the adapters and fast shipping. Really great, and I highly recommend them if you're looking to do a PST mod of some kind. Playing around with some configurations to test fittings, how tight everything is, weight, etc. Pretty heavy! Very substantial weight for an imaging train and will create a significant moment arm I imagine. I have an update and first light. The image will merely represent proof of concept in that it's working and not at unreasonable settings. 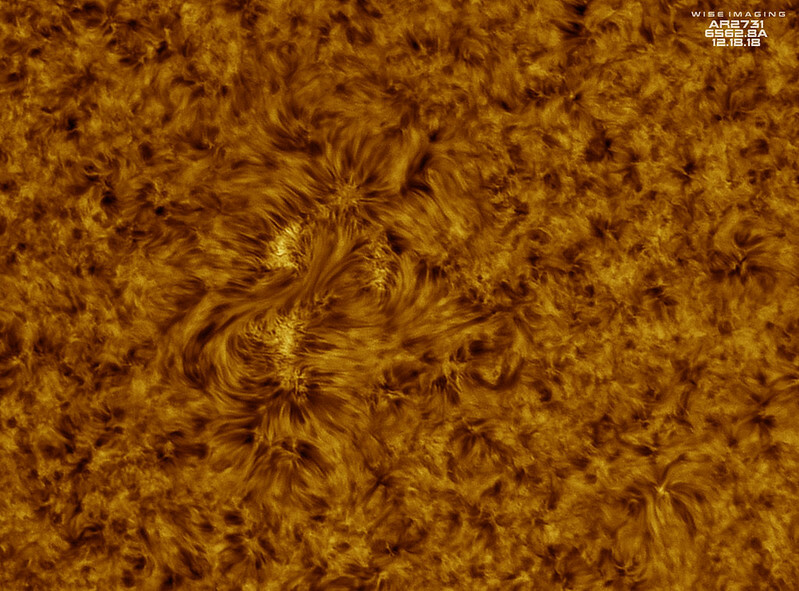 I had to test and attempt a little imaging through clouds today (of course, right? ), so I didn't spend a lot of time and will wait for a clear day to attempt anything serious. For now, this is enough to show proof of concept and that it works. I'm using 195mm extensions currently and can achieve focus no problem. 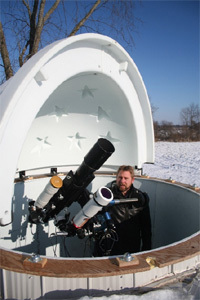 The Quark has a 2" eyepiece holder installed. I'm using the AOK adapters, front & rear, without modification to them and that holds the PST etalon housing without collimating lenses. This inserts into the Quark's 2" eyepiece holder and is secured there. I used a 1.25" adapter in the 2" eyepiece holder side of the PST rear adapter and inserted an ASI174MM camera with a 1.25" nose installed and a 1.25" 0.5x GSO focal reducer on the end of that. I was able to still achieve focus no problem. It was very cloudy, I did not have transparency at all, so this was for a brief few seconds with clouds moving through it. I was able to get this at 10ms, 120 gain at F17 with both the Quark & PST Etalon together after tuning them to a uniform image. There is no flat calibration applied here either. 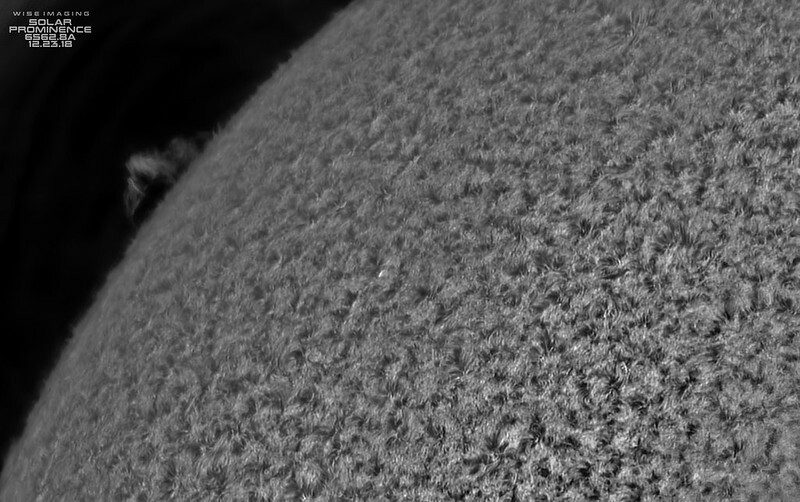 I did crop away vignetting from the focal reducer and merely showing the AR (there was much more in the FOV). This is merely to show that it's working, focuses, and tunes together well and is on band and happy. I'm totally fine imaging at 120 gain at 10ms at this image scale. However, again, this was through clouds. Without clouds, this will be much lower gain. It seems this Quark and this PST etalon have good transmission levels. I do not think this capture represents anything more narrow than what my Quark achieves on its own with an F35~F40 beam. But, I didn't expect to effect my bandpass at the most narrow side. I didn't get to image it yet, but I briefly saw the limb between cloud bursts, and the double-limb suppression was pretty clear, so if anything, the PST etalon is helping shave the skirt around the transmission profile of the Quark's bandpass. My main goal is to simply eliminate the double limb. So I hope to show that soon when the storms pass and the clouds let up. I will update with limb images as soon as the clouds clear, to really show if this suppresses the skirt and takes out the continuum double limb. This image merely represents that focus was possible with a focal-reducer, and that transmission is acceptable for imaging. I had some clear sky this morning so I was able to test a few things. I tested more configurations and rotations. It definitely behaves like polarized light between the two etalons, as every 90 degree turn results in black out, while at two spots opposite each other in the rotation light passes through and they tune the same at both spots. Interesting enough. 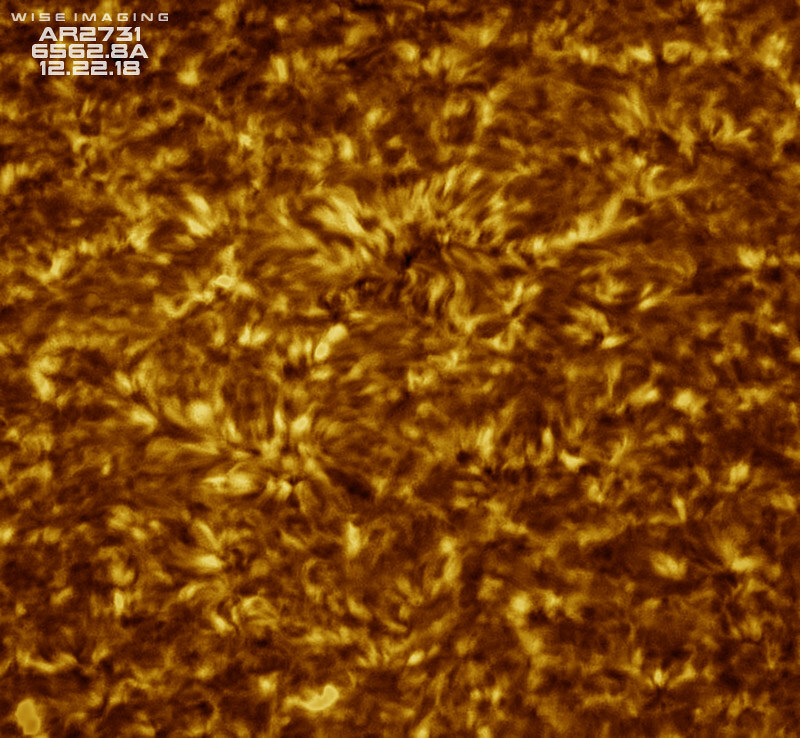 I was able to get some limb data and a some data on AR2731 again. I tried a few scales just to test the transmission level and all that. I added an ST80 to the mix, with a 60mm aperture mask. I like the idea of being able to move the Quark & PST etalon system from one scope to another, without much effort or time, and image at two scales quickly. 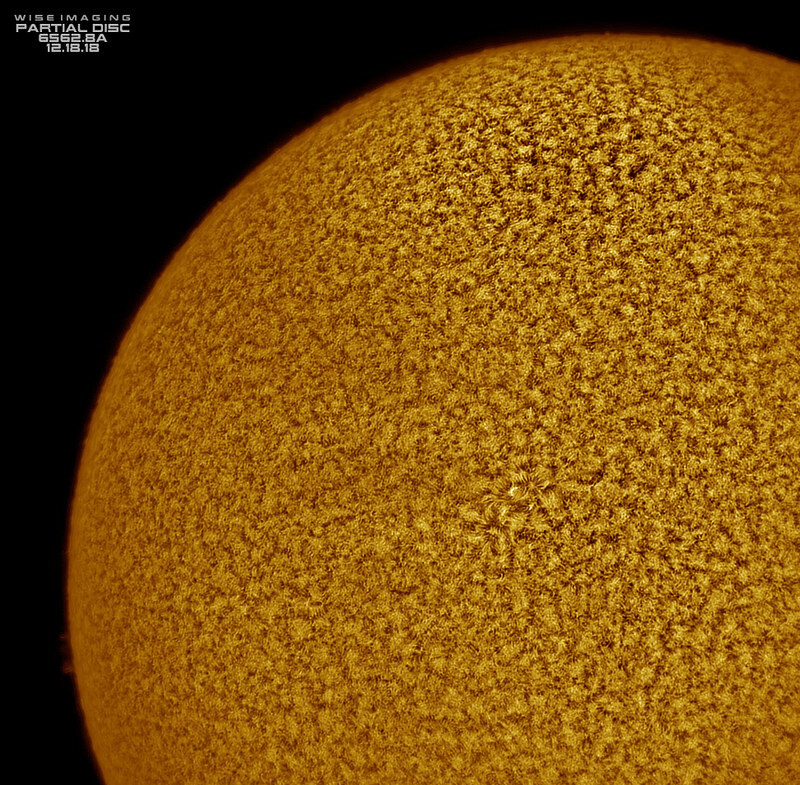 I tested this by doing some partial discs, and attempted a full disc mosaic with 4 panels captured & stitched. I wasn't able to do a flat calibration frame on the smaller scale due to not filling the FOV with the disc, with the focal reducer. Still learning how to expose & process the limbs, it's not the same now. I am definitely challenged by the new approach to acquire data and process it without destroying the limb. It's probably not as tight as a much more expensive double stack system, but it's tighter than a single stack for sure. I am currently challenged with how to acquire data. 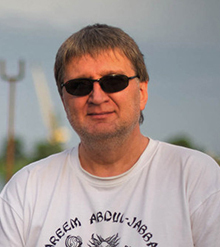 Whether to expose with maximum gamma, or no gamma, or a combination. 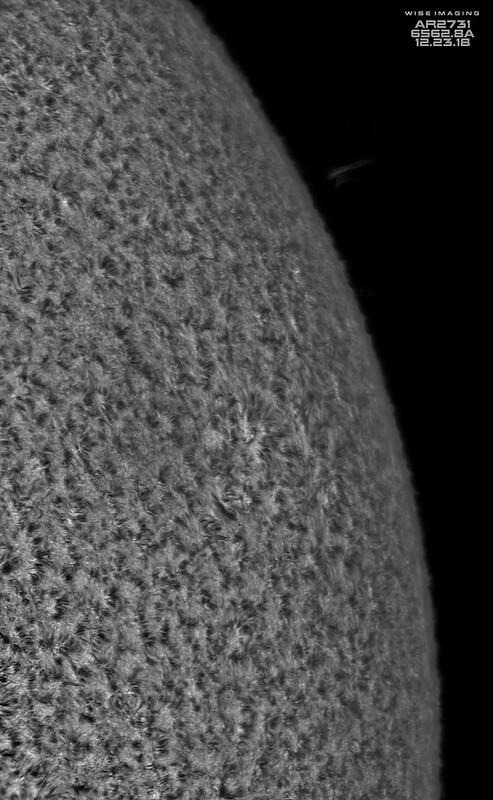 And then later, how to pull up the delicate prominences & spicules, or how not to destroy the transition at the limb and lose it when recovering contrast. I attempted two ways today, both maximum gamma and zero gamma, and both presented with challenges. With max gamma, I am challenged in recovering contrast on the disc surface. 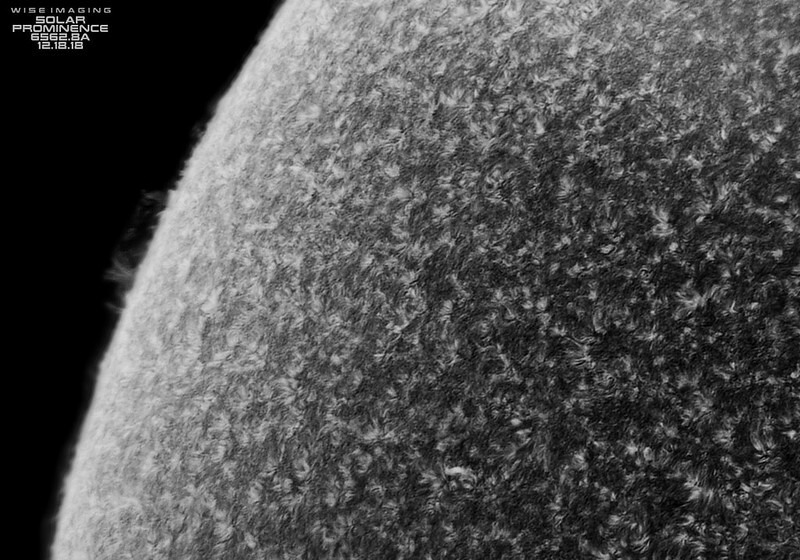 With no gamma, I find it much harder to retrieve the spicules & prominences and find the limb suppressed of detail while there is high contrast on the surface. 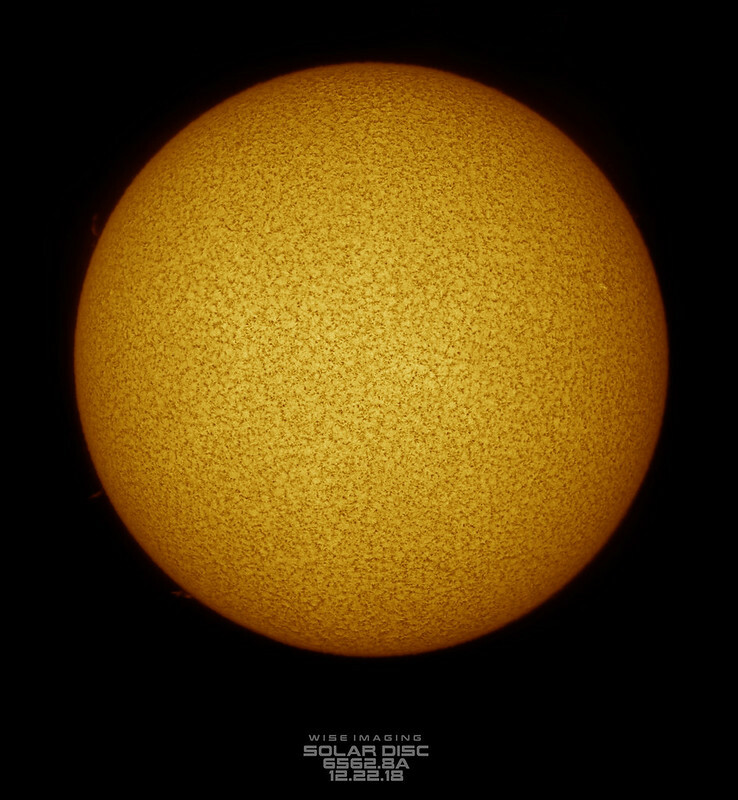 Seeing was really bad today, despite high transparency and no clouds. Sigh. 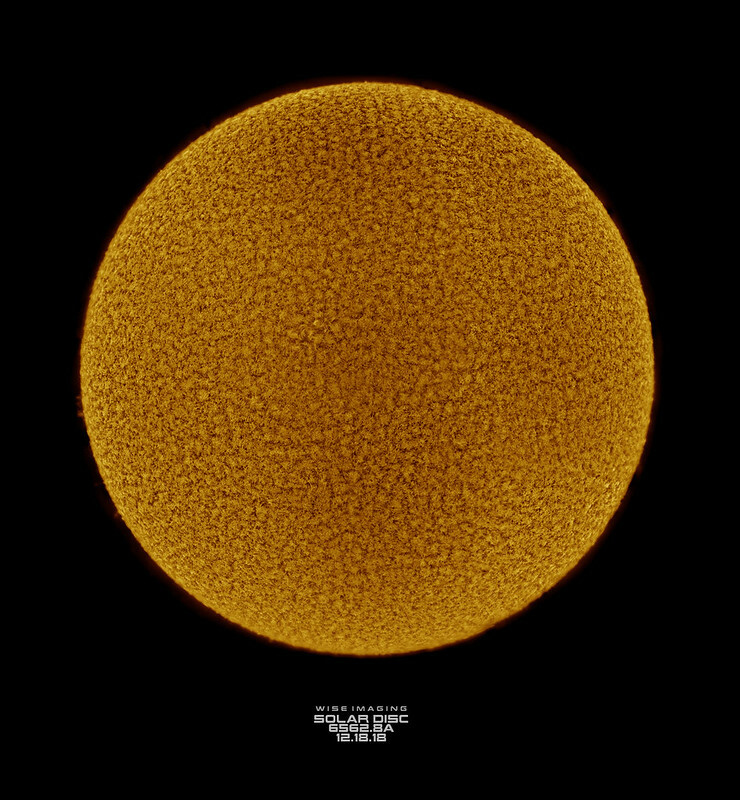 Full disc mosaic made with the ST80 (400mm F5) masked to 60mm (F6.67) with the Quark & PST etalon. 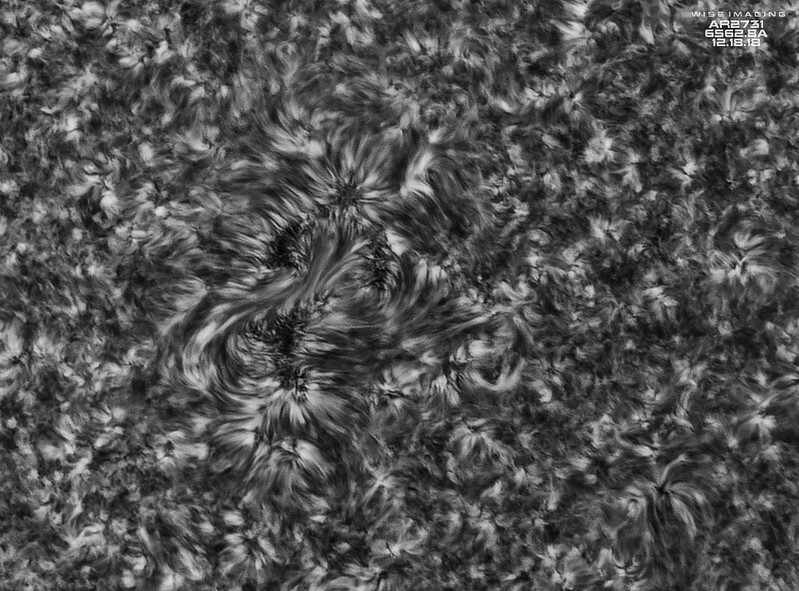 And here's a really weird example of trying to manipulate the data to keep the limb and contrast without losing the spicules & proms, but this is where I'm challenged the most and need to figure out how to process this data better. Personally, I always go for zero gamma. I agree Mark. I use minimal gamma in my capture process, generally underexpose, and bring out almost everything in post-capture processing. Have you used 'shadows and highlights' in your post processing Marty? This is an artefact that this can produce. I'm going to try more without gamma and switch to FireCapture. I have tried Shadows&Highlights in Photoshop. On the same images that if I pushed gamma, I would see the proms clearly, when I don't use gamma and simply use Shadows&Highlights, the proms do not lift nearly as clearly. This makes me wonder what "gamma" really is in SharpCap. So I'm switching to FireCapture today to see if there's a difference in acquisition and will move towards no-gamma or minimal gamma if possible. 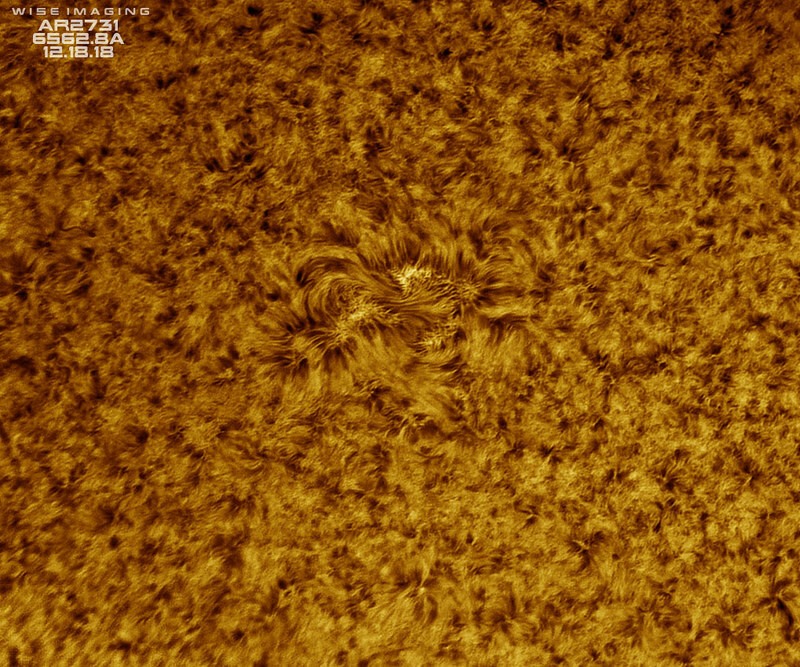 I will also try to use AS!3 and Registax6 to stack instead of AS!2 to see if it makes a difference on the limb. When I lift this one, the limb is bare, and the proms are barely there without definition. The same capture with gamma use shows a lot more. So I'm confused what gamma is doing in SharpCap, if it's just artificial, but I cannot even push gamma in post and see the same thing it does when I'm using it real time in SharpCap. I grabbed data this morning, single stack & double stack. I started using FireCapture. Worked out my learning curve but got some data. I have to say, I'm a total numpty for not moving to FireCapture sooner. I also used AS!3 this time. I did not use gamma (unchecked the box). It looked so different in the preview window than I'm used to. 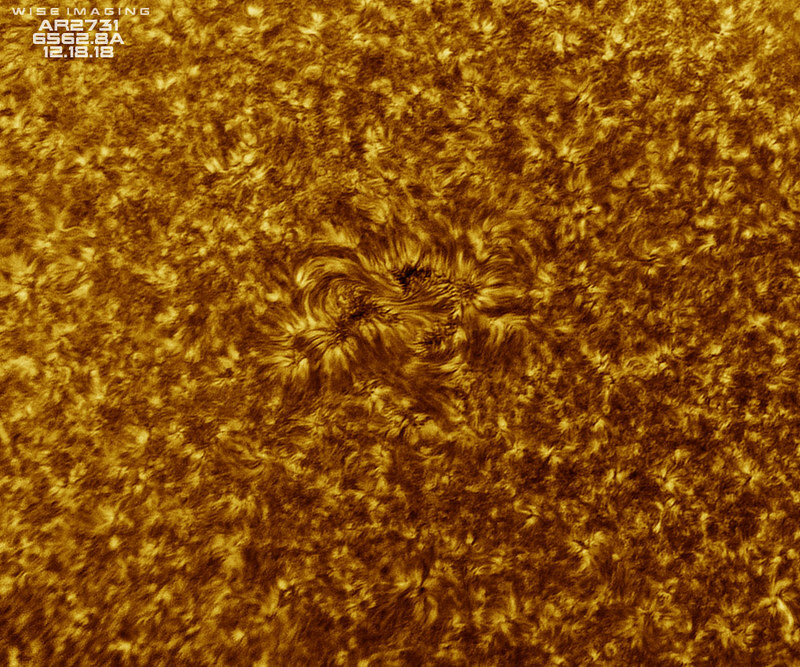 Even though gamma was off, I was able to see proms & surface in the same exposure just filling the histogram. My main interest was the limb of course to see if my tuning was on band with both and if the double limb was taken out. Here's the result from the double stack Quark & PST tuned together, no gamma, just a flat frame, and some minor sharpening of this morning's prominence & limb. 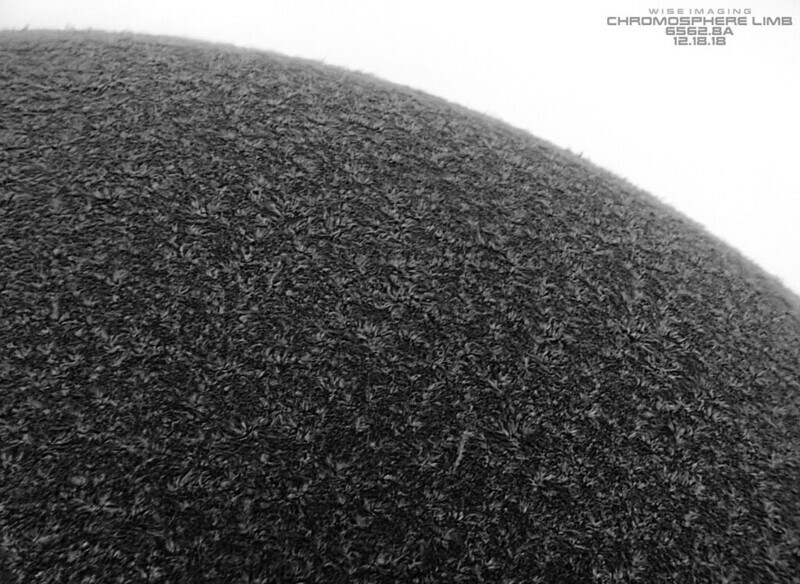 I feel the limb spicules alone are a big change, and that AS!3 did a much better job of preserving that. FireCapture made it a lot easier to get the data without gamma too. I still think I over-exposed as my disc is bright and when I compress mid-tones I lose the limb & proms. I think this is a processing issue on my part that I'll work through. I'll update with more as I process through this stuff. I was playing with processing. I found that if I used Shadows&Highlights to reduce highlights while pushing up shadows, I was able to find a more happy flat medium between the two, gaining some contrast back. I feel like I still have a long way to go with this setup, but this is at least improvement from before. I may have been off-band a bit with one of the tuners (the PST one at least I tuned, I don't tune the Quark, it's already set). I still feel like I'm seeing a bit of the double limb, but I'm not sure if it's my processing or what. I need to spend more time making sure both etalons are perfectly on band together. Yesterday I was able to see crazy contrast on a filament and that helped a lot. Today I didn't have such a feature to work on and mostly just looked for increased contrast near the limb around spicule bundles as they would pop in and out of high contrast and just used that. Here's a look at the contrast I'm getting on spicules near AR2731 that I used to help figure if I was tuned on band or not. Here's an example of the limb with only the Quark, single stack, no PST etalon used. The double limb is very obvious of course. I just wanted to test and compare. And here's the Quark & PST etalon together again. I can still see a bit of the double limb. I'm not sure if it's due to tuning. Or maybe it just isn't able to suppress the skirt. It's less obvious, but it's still something I can see. FireCapture made quite a difference in capturing and doing flat calibration. Using the same exposure values that I used to use in SharpCap, normally I would see a contrasty surface, but no limb/proms. In FireCapture I'm seeing limb/proms with the same exposure values. I'm not sure the difference. Drivers? I have gamma unchecked, so it's neutral. But it looks like how it looked in SharpCap with Gamma turned up. Granted, the results are significantly different. Still not perfect. But I'm still learning to use new software. And I have to re-learn processing this kind of data differently. 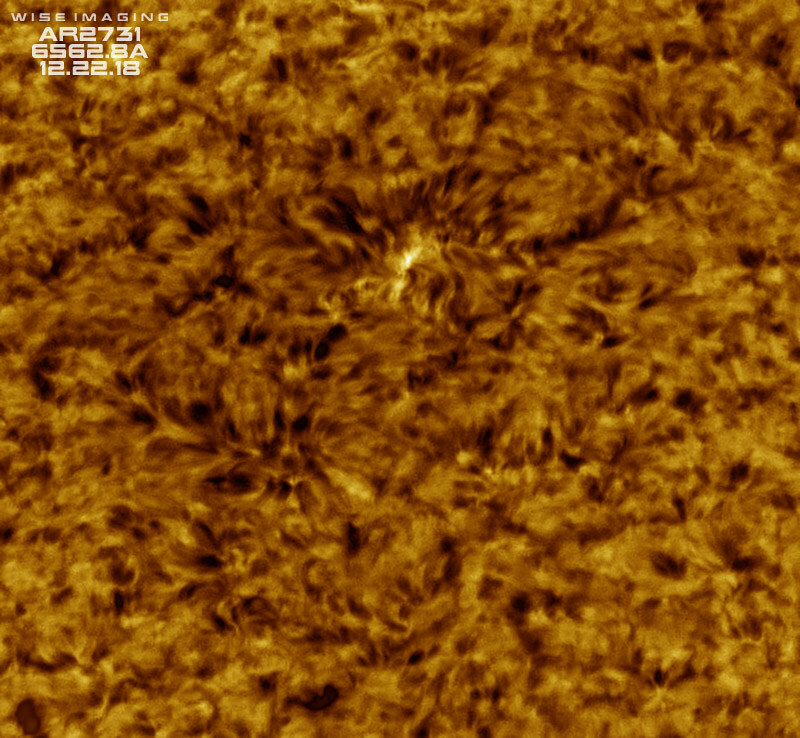 AS!3 I think did a better job keeping the limb and spicules. I can't get Registax to handle my files, maybe they're too big. Yea, I see the limb, I will have to find a way to best tune it. Then again, it may never get rid of the double limb completely, it may not be tight enough in this configuration. I may also have to reconsider how I tune my Quark. I tune my Quark as far to the blue side as possible, so 9'oclock on my Quark, and it has the most contrast there. It may be beyond what the PST etalon can also tune to? I may have to try re-tuning the Quark and then tune the PST to it? This will be quite the project if that's the case. But, if it means no double limb, that's the point hopefully! 4.4Gb (33 seconds), 2000 frames. I'm on 3G speeds with my air card (I live in the boonies), so even if I shaved it down, it would take a long time to upload some where. But I'd be willing to try something if you have any ideas on how to best shave it down without culling good data. That first image is nice - try running with the same settings but the histogram peaking around 70%. It's easier to stretch an image than squish the histogram back.